We are always excited to be able to explore ideas for affordable housing in neighborhoods that could use housing and good design. Recently our MWA team came up with a proposed design concept for an industrial area of Oakland – Brooklyn Basin. Even though another firm was ultimately selected for the site, we wanted to share the work everyone did in envisioning a new community on this complex and challenging site. The challenge was to incorporate 211 units of senior and family living on a tight site with no other completed multifamily housing projects nearby to reference. We were asked to conceive the family building with a mix of one-, two- and three bedroom apartments and the senior building with predominantly one-bedrooms. Sometimes the best inspiration comes from spending time in a place – we explored the area on foot. We wandered about the adjacent artist community at Fifth Avenue Marina; we walked the old wooden boardwalk by the 9th Avenue Terminal, and looked at the old rail lines that had served this area so well in its bustling industrial heyday. 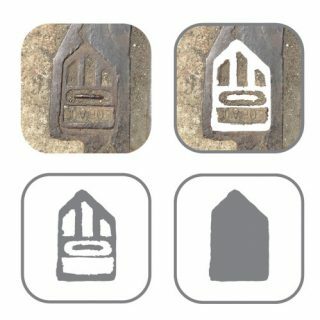 It was on the old railroad lines that we saw this little detail forged in steel that stood out as a symbol of both the past and the future and we used it as a graphic throughout our proposal. The site’s industrial past, existing marinas, resident artist community, and plans for a mixed-use and mixed-income neighborhood provide contextual inspiration for the project to further the vision for the area while creating a sense of place for its residents. Views and design elements linked to the water connect residents to the benefits of a local natural habitat. The design takes full advantage of the context by providing bright daylit interiors and beautifully crafted, economically efficient, modern homes that blend indoor and outdoor spaces. These newly created spaces are intended to foster community both within the housing development as well as the larger mixed-use neighborhood. We created an inspirational visual palette of design drivers to translate the project’s context into design concepts. In addition we were guided by the idea that the new housing should be resilient, interwoven, connected, and remain true to its industrial past. Community resilience is a measure of the sustained ability of a community to utilize available resources to respond to, withstand, and recover from adverse situations. In an economic sense, this project as affordable housing will utilize the resources of the larger development to enable socio-economic housing diversity. Physically, the project must consider its nearby waterfront in selecting materials and details that can effectively withstand the elements. At the neighborhood scale, Brooklyn Basin will weave disconnected fragments of Oakland together, along the waterfront and through 5th Avenue. At the project scale, the two developments provide a potential for low-income intergenerational families to live in close proximity to one another. Interwoven façade precedents show how simple massing and repeated patterns can be enlivened with active fenestration and a limited material palette used in a variety of conditions. Creating connections both within the project, the environment, and the larger community are key to a successful design. The open courtyard design connects this project to the waterfront. A grand stair is located at the focal point of Brooklyn Basin Way to connect the sidewalk to the upper podium. The family housing is connected to the senior housing through the glass ground floor community spaces of the senior housing. Views from the corridors and common spaces connect to the courtyard throughout the project. The industrial and maritime history of the site inspires the design team. We will look to that history to inform the housing while remaining livable, affordable, durable, and require minimal maintenance. The two distinct resident populations on the site allow for the creation of a multi-generational community, yet have distinct, secure, population-specific services and spaces. MWA’s concept places a community-focused bar through the middle of the parcel at courtyard level, both bridging and dividing the recreational and residential spaces of the two buildings. 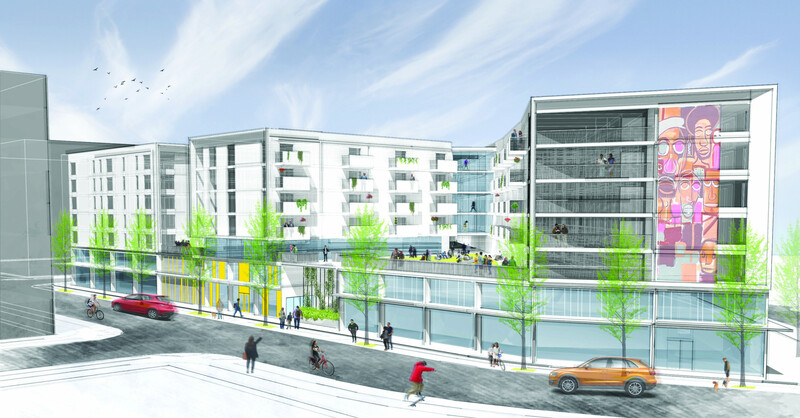 In a larger context, the central bar and grand stair along 8th Avenue connects the affordable housing development to its neighbors and the water. The central bar aligns with the adjacent building. The grand stair and podium-level open space provide a focal point for residents to connect with the water and visitors to connect with the development. The challenge in providing two fully functioning, free-standing buildings is potential unnecessary duplication of spaces and services. 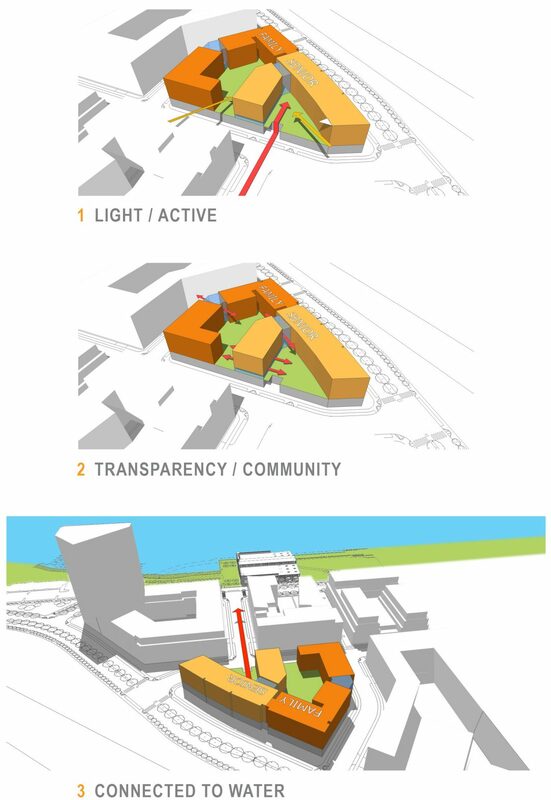 We have assumed that MidPen will manage the two buildings as one, but might require flexibility of both joining and separating the distinct resident populations. The central bar with its location adjacent to both buildings serves as a gatekeeper to MidPen’s intentions. It will be open and visible to both the families and seniors, and allow resident gatherings to be population-specific or all-inclusive. Community spaces of the two buildings are located intentionally on two levels and with different programming intents. While the community spaces on the podium are resident focused and can be open and flexible for resident use, the community spaces on the family side at ground level are intended to have more specific programming and intimate spaces within. The ground level community room can accommodate both residents and neighborhood or professional meetings, and create a child-friendly learning environment – all without distractions or disruption. “Donut” schemes can provide great urban edges, but on small tight sites, buildings can significantly affect the amount of natural daylight into the courtyard and interior of the space. By turning a bar inward instead of along 8th Avenue, the building opens up to the south and brings in natural daylight. Openings in the building at key intersections bring daylight and wayfinding into corridors, connecting residents to the outdoors and fostering community. The building and overall development is complex with a triangular site and required property line. Within that, we created a simple building, massing, and elevations to utilize the unavoidable complexity. Unit floor plates remain the same even when the façade along Embarcadero is faceted. Units and floors stack while the elbows and inside corners become community or service spaces. This provides a dynamic building with a cost effective design approach. The podium courtyard is aligned to create an active focal point at the end of Brooklyn Way. We then created a grand stair that will bring the activity of the courtyard down to the sidewalk level for a vibrant outdoor space.